I actually have one more day of work before it's my Friday but I will not begrudge you your celebration today. You earned it. Before we get to today's card I wanted to direct you to something that made me smile. My dear friend Darnell CASED me. Her vibrant card is just as beautiful as her personality. You can see her CASE here. Speaking of friends, my friend Tammy left me a sweet comment the other day. 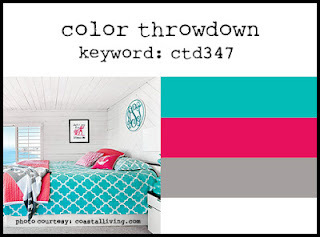 I visited her blog to leave her some love and saw her gorgeous card for the current Color Throwdown. I immediately fell in love with the colors and vowed to make a card for the challenge. Sometimes I have to vow otherwise I just don't get to it. Vows are serious business. That bright pink and blue. um. yes. I also missed a butterfly challenge with Wednesday's card. 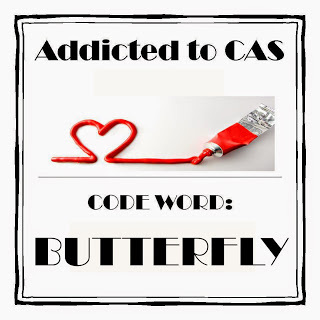 It's the codeword at Addicted to CAS this week. Can you believe there were three at one time?! How fortuitous that I happen to adore butterflies? Naturally, I went with watercoloring. I have no idea why that's natural. It sounded good. Don't think about it too much. I stamped the large butterfly from Wplus9's Flora and Fauna in their Pure Black ink. I added random Peerless water colors all around my butterfly in blues/teals. Once they were dry I added hot pink to my butterfly. That pink just makes me happy. I smooshed it out of the lines a bit. Add some spatters because they look cool and I've seen people who know what they are doing do that. Once it was dry I added a bit of white gel pen to the butterfly for some added detail. I also drew in a shadow it help give it a 3D effect. I masked the butterfly and stamped the sentiment off to the right in Soft Granite ink from Hero Arts. It's part of the June Release and is from Greetings & Salutations. Add a strip of grey to reinforce the subtle shadow and sentiment. I'm off to get my hair did. It needs it. SO. BAD. I just love the flair with which you create Kelly! Amazing card! Be still, my heart...this is one absolutely gorgeous work of art, Kelly! I love your water coloring and your details are just amazing, Kelly! Thanks so much for playing along with us this week at Addicted to CAS...it's always fun to see your beautiful creations in our gallery! Oh, my, Kelly. This is amazing! There is so much depth and I love the bright colors! The white dots add extra pizzazz! Thanks for sharing with us at ATCAS! The world can never have too many watercolored butterflies, Kelly, especially when they are this bright and beautiful, sitting upon a lush background made by (IMHO) someone "who knows what they are doing!" The white dots and shadow take this from tops to over the tops!! Screamin gorgeous! Thanks for joining in at ATCAS! Wow! this is stunning! Those Peerless watercolors seem to have the brightest colors ... I must try those, Kelly. Wow! I am in LOVE with your gorgeous card! I'm pinning this! It always amazes me how you work magic with vibrant colors! Gorgeous card Kelly. Love the bright pink butterfly over the blue water colored splash. Very eye-catching. Thank you for playing along with us at The Color Throwdown. What a gorgeous card, Kelly! Love your pink smooshed watercolor butterfly!! Thanks so much for playing along with us at the Color Throwdown this week! Sigh, this could not be any more GORGEOUS, love the background you created for that amazing butterfly! That is a beautiful set of colours! Love how you anchored your butterfly to background with that *hello* stamp! Brilliant! wow so bright and gorgeous! Oh. My. Word. Pure gorgeousness - those colors just sing on this card and make my heart feel happy!! So impressive! !